Gail Parker, William Byers and I were so excited to debut the documentary we produced titled “Walking Tall: The Life and Wife of Walt Walker.” Gail directed and William shot much of it and edited it while I I wrote the scripts, co-produced and delivered the voice-over. The story centered around the life of the late Walt Walker, a pioneering African American artist and his wife Jane who was his business manager. The video was nominated best short documentary at the Pan African Film Festival and was also screened at the Hollywood Black Film Festival. 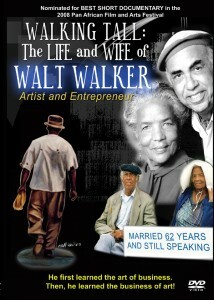 Mrs. Jane Walker is available to speak and is looking for opportunities to distribute the film. The DVD and details are available at WaltWalker.com.